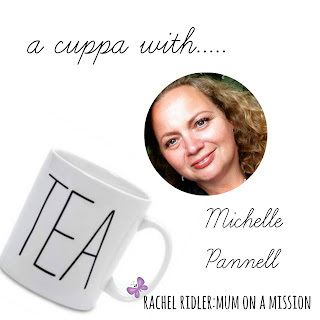 Welcome to this weeks edition of “a cuppa with”, where I get to sit down and have a nice cuppa and chat with inspiring Christian women. If you missed last weeks with Gemma, do catch it here. It’s really nice to meet you – please introduce yourself to us all! Hi, I’m Michelle and now I don’t have one primary job anymore I find it quite difficult to introduce myself nowadays. I’m trying out the label ‘child of God’ at the moment as this best sums me up. As well as being a beloved daughter of the living God I’m also mum to three, wife to one, an activist, blogger, freelance writer, trainer and volunteer. I like to keep busy! Where do you live and what do you like/loathe about it? I’m a very lucky lady, three years ago our family moved to East Sussex following a very clear call from God and now we live and serve as part of a Christian community running a large Christian conference centre mostly catering for church holidays and breaks away. I love the fact that we live in 220 acres of beautiful land and that everyone here gets being a Christian and that it is not just a small part of life you can turn off at will but don’t get me wrong community life comes with many challenges. How many kids do you have? We’ve got three children. There is JJ who is 12 and in his first year at secondary school, he is super bright and very mature for his age. I love spending time with him as he has a wicked sense of humour and a real desire to serve, we enjoy working alongside each other at the Food Bank warehouse each week. My other two children are near 9 year old twin girls and I refer to them as my chalk and cheese twinnies as they couldn’t be more different. Miss E is my creative one, she is a worrier and very caring but with a real passion for justice and Miss M is the one who will go places. This little lady will challenge any authority and isn’t afraid to create a storm, whilst retaining a soft and vulnerable core. What is the best thing about motherhood for you? I never thought I wanted to be a mum, so it is interesting that I now have three children and stay home to look after them. God really does know what is best for us and he files off all those hard edges. Probably my favourite part of motherhood is being able to educate my children and help to open their eyes to new opportunities and changes that they might have to make. It is not easy but I truly believe my task as a parent is to help my children be great adults and that requires firm parenting with defined consequences. And what is the worst thing?! This is probably a toss up between my hate of bickering and the constant whinging that can be heard when my kids tease each other and the far more serious hurt I feel when my kids realise that life isn’t fair and the world can be a horrid place. When I have to hug one of them as they cry into my chest that no-one at school wants to play with them or they question me about why some girls have to get married aged just 12 years then I know that being a mum isn’t always easy. How do you try to help your children connect with God and the bible? Living as part of a Christian community this has become easier than in previous years as we have regular prayer meetings, times of worship and communal meals. The kids norm is to hear the name of Jesus every day and to mix with young people who love God more than anything else, we really are very blessed in this respect. We are also part of a large and vibrant local church which has very good kids work and encourages the children to get out into the community and offer real help to local people living on the fringes. I have to be honest and say we do not have prescriptive times of prayer with the children any longer as we just have a constant rhythm of prayer. One or more of them will often accompany me to the prayer centre whilst I read my bible and they might pray, paint or play music. We also have a good children’s daily devotional that we often use after our dinner to study a short part of the bible together or Miss M will present it to me sometimes so we can do a bible study together. JJ is probably the hardest to engage as he is not sure what his beliefs are as yet but I’m content that he is being exposed to Christians living real life every day, he volunteers, he willingly goes to church and he is happy to attend church youth club too. I’ll keep on praying that he makes the full commitment for himself one day and his heart will be on fire for Jesus. What is your “mission-field” at the moment? When my Mummy from the Heart blog became public in 2010 God clearly guided me that I was to reach out and demonstrate to people that Christians are regular, normal (whatever normal might be) people too. My readership in the main are females aged between about 25 and 60, so these are the people I am reaching out to.My strap line of ‘Wife to one, mummy to three. Join e on my imperfect Christian journey’ has always been a clear steer on who I am and what I’m about. What causes or activities are you particularly passionate about and why? I’m passionate for justice in many forms and I love to help people grow and develop too so you can just as easily find me travelling to Ethiopia or Washington with an anti-poverty campaigning organisation as you can life coaching a young Christian. I only became a Christian fourteen years ago but I was convicted very early on of the need to show compassion and God broke my heart for those living in poverty, so this is generally the cause you will find me writing or speaking about most. Where do you blog and what do you blog about? My original blog is Mummy from the Heart which is my outreach tool (and has sat as the number one faith blog in the UK for just over a year) and recently I’ve started writing at Progress Not Perfection, which is a more overt faith based blog. I write about whatever takes my fancy at the time but it is always an honest and forthright read. Thanks for joining us again this week, and I’ll see you for another cuppa next time! Mum on a Mission – Inspiration for June! I really enjoyed reading this! Great to get to know you better Mich! Living in a conference centre sounds amazing.